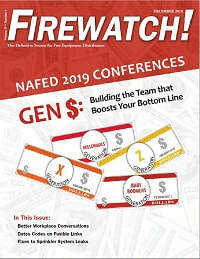 NAFED's quarterly, full-color magazine is sent to members and subscribers. Join now to begin receiving this valuable industry resource. Members also have access to full issues in the Firewatch! archives. Learn more about fire-rated cabinets: how they help maintain the fire barrier in an occupancy and how they are listed and tested. Many accidental discharges come down to load factor. Here’s what to consider when installing fusible links. There are many ways, big and small, to get involved in your association. Find out more! You’ve got the knowledge, now share it with your customers so they can meet their OSHA requirements! Rich Watson breaks down what to cover in a fire extinguisher training class and what materials you’ll need for a live burn. Sales technicians come in many packages, it’s how they do the selling that matters. Bruce Carter shares more lessons from the road by observing how one phenomenal employee does it.